The Doge's Palace guided tour departs everyday at 10.45 am and 2.15 pm. The Doge's Palace is open all year. We are comparing Skip the Line Doge's Palace Tour Prices from leading ticket suppliers and Try to find you Cheap tickets prices on the market. If you've ever visited Venice before then you'll probably recall the long line which spills from the entrance of Doge's Palace all the way along the banks of Venice Lagoon. Well don't panic, because with the combined Skip the Line and guided tour ticket you'll be able to breeze past the queues and dive into discovering the former seat of the Venetian Republic. You'll be introduced to your friendly guide on St Mark's Square who will take you on a 1 hour guided tour. Let their engaging commentary transport you back to the times when the Duke of Venice sat in magnificent palace halls with his council of politicians. Aside from lavishly furnished rooms and grand Venetian glassworks you can admire the artworks of Tintoretto, Titian and Veronese. You'll then move away from luxurious suites, cross the legendary ‘Bridge of Sighs' and descend into cold prison cells beneath the palace. It was in one of these cells than Giacomo Casanova was imprisoned. During the tour you will also visit the Opera Museum, the ‘Giants' Staircase', Golden Staircase and pass through the sculpture-filled Atrium. After the tour you are welcome to remain inside the palace and continue exploring. Suitable for people of all ages and mostly accessible to wheelchair users. If this is your first visit to the Doge's Palace then a guided tour will be very useful and interesting. Your Experience With Skip the Line Doge's Palace Tour ? 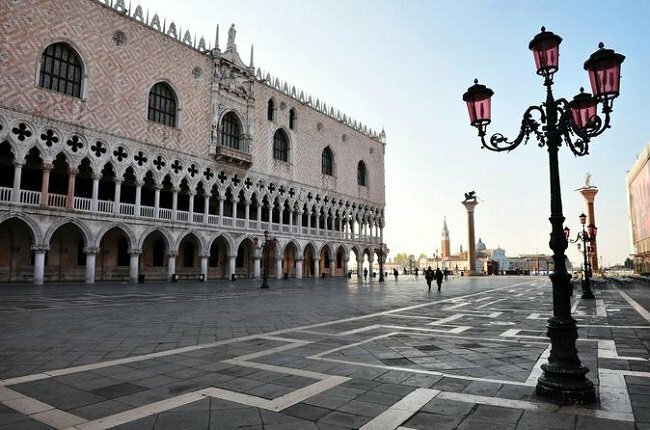 Visit one of Venice's most popular attractions, the Doge's Palace. Don't waste time queuing, instead enjoy priority entrance to the Doge's Palace with a skip the line ticket. Learn about the history of the Doge's Palace, politics of the Venetian empire and the Dukes Council from a multilingual guide. Visit the prison where Casanova was kept and walk on the Bridge of Sighs. What Skip the Line Doge's Palace Tour Includes? Skip the line entrance ticket to the Doge's Palace. 1 hour guided tour of Doge's Palace in English, Italian, German, French or Spanish. Professional and friendly tour guide. If you are visiting during the busy season then try to reserve the first or the last tour, this is when the Palace is less crowded. Travelers Reviews about Skip the Line Doge's Palace Tour ? Most people who have participated in this tour would encourage you to book it. Feedback is very positive and the tour has a score of 4.4 on the Get Your Guide website and 4.5 out of 5 of TripAdvisor. Some reviews say that the highlight of a tour of the Doge's Palace is walking across the Bridge of Sighs. Please bring your ticket either in print or electronic form. Cancellation fees may apply if cancellation is not made at least one week in advance. From November to March tours are in English every day, tours in other languages are available on specific days. From April to October Italian tours are every Saturday, tours other languages are available daily. There may be a short wait at the entrance for security checks. Meeting Point: In from of YEX Change Office, by the Clock Tower on Piazza San Marco.